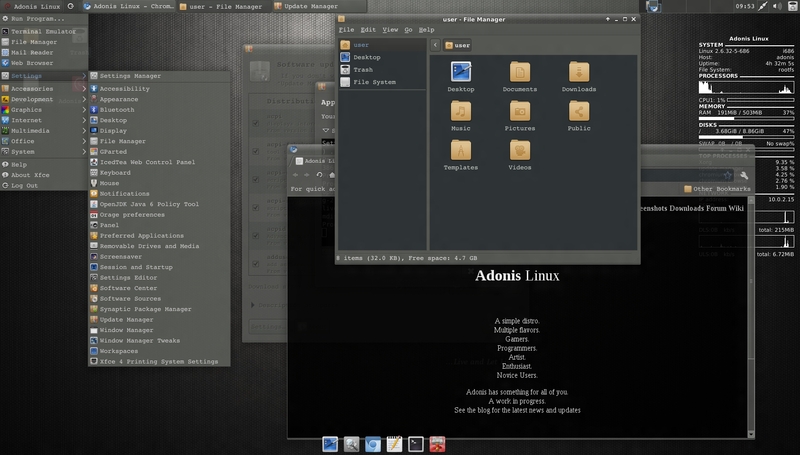 Adonis Linux is a very bare-bones XFCE based Linux distribution. It runs the testing version of Debian, and uses a pseudo rolling-release model. Never re-install Adonis since it uses a rolling release model. You will be constantly exposed to the newest versions of packages. Adonis Linux is fully open source. See all of the various packages on Github. Learn why Adonis Linux was created. 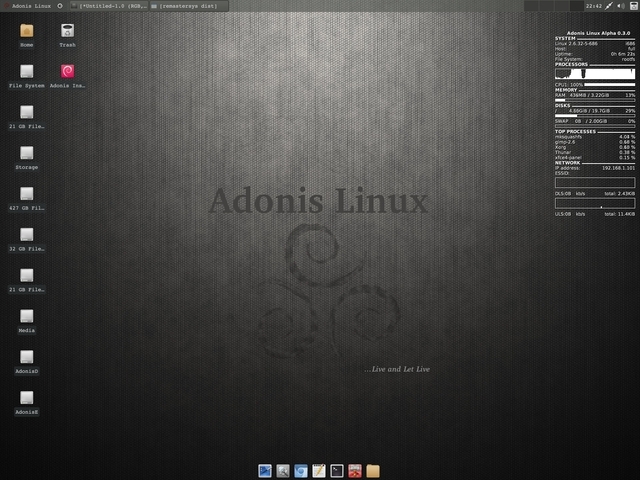 Adonis Linux started in June, 2011. It aims to be a easy to use Linux Distro for users of all experience levels. The first initial release (0.0.1) was on July 30th that year. The first official beta release (0.5.0) was on the 15th of January, 2012. The beta release made use of Xfce 4.8 on Debian Testing. It had a lot of rough patches, but it was a good start. From here, the first official release (1.0.0) was on July 30th, 2012, a year after the project was started. Three editions were release, the main Adonis Linux distro was based on Debian testing with Xfce. A second build was released, based on Ubuntu and came with Cinnamon and Gnome3. Lastly, a server edition was released, based on Debian stable and Gnome2. The Ubuntu version was announced that it would be dropped, and that Cinnamon would be moving over into another Debian flavor since it had sufficient support then. Feel free to contact us for more information, or if you have any questions.